I'm looking for brunch recipes that can be almost entirely made ahead. Any great ideas for me? I'm thinking maybe a frittata or individual quiches that I just throw in the oven when the guest arrive? Or breakfast pizza might be fun. To make things interesting, one of my guests is pregnant and doesn't like cheese. I just consider that a recipe search challenge! Any great ideas for me? The Insider knows who Rachael Ray's celebrity crush is. Brad of My Dinners with Rachael has decided to do a year's worth of Rachael Ray's recipes! I admire Brad and Michelle. While 99% of the recipes I cook are from Rachael Ray (sadly, not an exageration), I am not sure I could have the energy to cook that often. Four nights a week is about my max. Katie W of Notes from the Kitchen Sink made Salmon Grill Packets and dubbed them the best meal you will ever eat. Cooking with Christy B features a recipe for Steak Butter from Every Day with Rachael Ray. Amy of Varnish got into some trouble on Rachael Ray's website. Allison of the Post-College Kitchen made Mexican Lasagna. 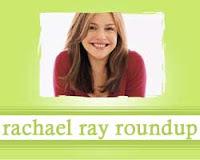 Steve Smith of Min Online offers some thoughts on the redesign of the website for Rachael Ray's magazine. Rachel of Rachel v. The Kitchen made Asparagus Carbonara. Kimberly of Kim's Concoctions adapted Rachael's recipe for Bacon, Leek, and Tomato Frittata. Maybe I should make that one this weekend? Holy cow, Madrigal. That recipe looks amazing - I love The Pioneer Woman. Great blog. My friend doesn't like cheese, but I bookmarked that recipe to try for myself! Anything with 1.5 sticks of butter is, by definition, good. Here is a modified Strawberry Bread recipes I recently made and got compliments on. Being pregnant myself I can say that it doesn't have any ingredients in it that are a "no-no". And you can make a strawberry cream cheese dip with any leftover strawberries. - Slice 2 cups strawberries, and place in medium-sized bowl. Sprinkle lightly with sugar, and set aside. - Puree banana and remaining strawberries together in blender or food processor. Set aside. - Combine flour, sugar, salt and baking soda in large bowl: mix well. - Blend oil, berry/apple sauce and eggs into sliced strawberries. Add strawberry/banana puree. - Add strawberry mixture to flour mixture, blending until dry ingredients are just moistened. - Divide batter into pans. - Bake for 60 minutes, (if making muffins, bake for 25-30 minutes) or until tester inserted comes out clean. - Let cool in pans on wire rack for 10 minutes. Turn loaves/muffins out, and cool completely. Thank you, Christina! That recipe looks outstanding. Just found your blog and wanted to say hi! I can't wait to scroll through your posts!